Father’s Day is June 16th, and it’s the perfect time to surprise Dad on his special day. Some people decide to wash the car, serve Dad breakfast in bed, or buy a thoughtful card – but what are you planning to do? Dad bears a great responsibility in keeping the family together, being the strong backbone while at the same time, being a caring and all-around loving man. This Father’s Day, why not think a little outside the box and do something a little different? Delight Dad with this attractive, personalized Father’s Day picture frame plaque. 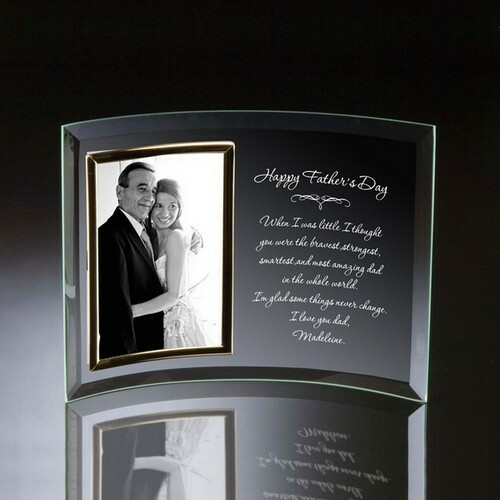 This customized curved glass frame allows for an eight line personalized message to Dad. All you have to do is put in a 4″x6″ picture of you and Dad in to the left, and place this item on his desk. He will definitely be in for a sweet surprise! 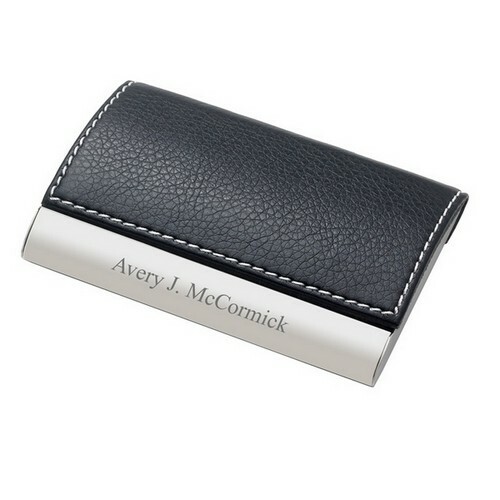 He may be very busy with meetings and emails, but will always be giving out his business card to a potential client or business partner, so ensure Dad carries his name in style with this high-quality, laser engraved business card holder. Sleek, compact, and modern, it will definitely be a step up from any plain business card holder. A simple yet useful gift, Dad will find great joy in this functional item. A necessity for any home office or desk, these elegant black marble bookends will help keep Dad’s favorite books and important work documents in order and style. 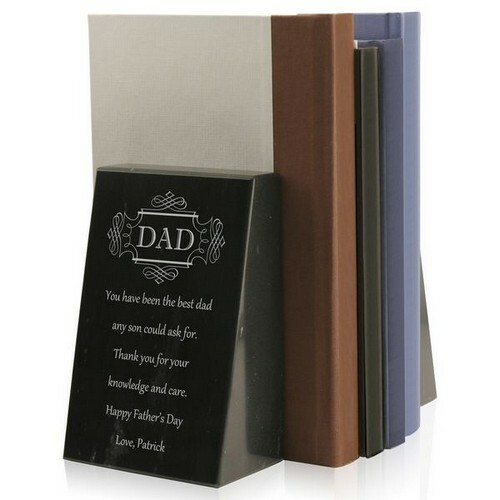 Remind him of how much you are thankful for his love through a personalized message that can be laser engraved onto the bookends, and he will be able to see that message day after day at his desk. These bookends are of the highest-quality and will without a doubt leave dad fascinated. Nothing organizes and functions better than this personalized desktop charger station. Featuring a rosewood finish and cushioned velvet, this office essential features 4 slotholes in the back to charge your electronic devices such as cell phones and digital cameras while keeping cords out of sight. With additional room for items such as a wallet, cell phone, car keys, and loose change, it’s the ultimate all-in-one accessory for Dad’s desk. This high-quality crafted item also includes a decorative 3 1/2″ x 4″ photo frame as well as a built-in pencil cup to store pencils and pens. The valet measures 11″ x 8″ x 4″ and fits beautifully on Dad’s work space, keeping all his work necessities in place. Sometimes the weight of the world seems to be on Dad’s shoulders, but take that burden off his shoulders and encapsulate it in this stunning high-polish nickel finish paperweight. 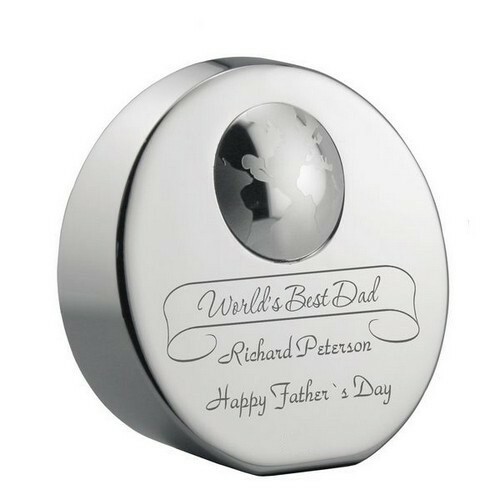 Express your sentiments towards Dad with this engraved paperweight that features the phrase “World’s Best Dad,” an embossed logo of the globe, and space for three lines of personalized text. This office desk essential will help keep important documents and papers in place and will definitely add style and decor to Dad’s work space. This Father’s Day, show Dad that he means the world to you with this personalized gift! So there you have it – 5 great personalized gifts ideas for Father’s Day. 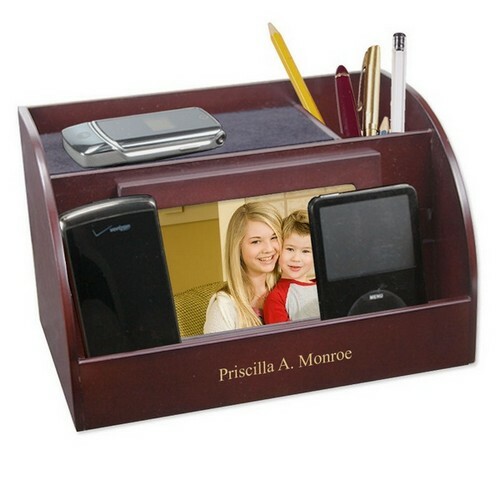 These items are all guaranteed to tidy up Dad’s office desk while conveying your warmest love. Happy Father’s Day to all the hard-working and loving fathers out there!